People love looking at pets on the internet. And that’s just as true, if not more so, when said pet is a 100-plus-pound mountain lion that wears hot pink sweaters and lives in your house. Or a stunningly gorgeous red fox that’s friends with a dog. Or a caracal (an African wild cat the size of a border collie) that snaps cat toys in its jaws before baring its inch-long fangs at the camera. Or a raccoon that eats blueberries out of a bowl with its foraging little hands. Simply posting their photos on Instagram virtually guarantees you a following in the tens of thousands—if not millions. Of course, owning and managing a social media account for an exotic or wild pet doesn’t necessarily mean you’re only in it for the likes. Many of these Insta-famous animals are rescues that can no longer survive in the wild. But it does contribute to and drive an exotic pet ethos that exists in a really soupy moral gray area. On one hand, these pets are ambassadors for their species, ginning up positive vibes for animals that often get more negative press. On the other, they may create increased demand for animals better left in the wild—and, through the magic of social media, make caring for those animals seem far easier than it really is. It’s bad enough when someone adopts a pet for the wrong reasons, but it is considerably worse when the animal in question isn’t even domesticated. Similar stories of exploiting wild animals for the likes and views are starting to emerge. Instagram in 2017 began auto-populating wildlife photos with warnings about animal abuse; YouTube star Taylor Nicole Dean faced backlash and accusations of animal hoarding when a number of her exotic pets died last year; and ur-bro Logan Paul got in trouble for being complicit in tiger cub exploitation just last month. Outside of this mega-influencer world—where everything is for the ’gram—things get murkier still. 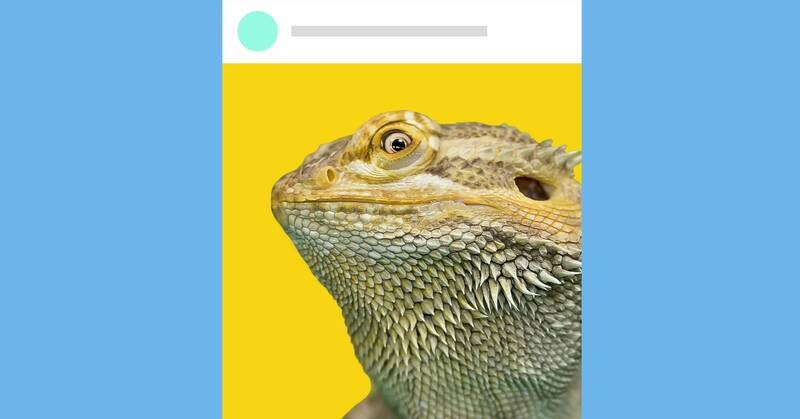 Instagram gives only a small, highly curated slice of what an animal’s life is really like, which raises some questions: Does Super Pringle the bearded dragon truly enjoy Thor cosplay? It also feeds into another, arguably more serious problem with Petstagram: People seeing photogenic and awe-inspiring animals, and mistakenly thinking that living with an exotic or feral animal is just a matter of getting the right food. The demands of virality can affect even non-endangered animals. “Popular culture creates sudden spikes in demand for a specific wild pet,” says Rosanna Vail, managing editor of the Human-Wildlife Interactions journal, who has been studying the rise of exotic pets on social media since hearing about a teenager being trampled by a once-cuddly feral hog. “Because of the Harry Potter effect, there’s a huge demand for wild-caught owls in Indonesia that’s starting to really impact owl conservation.” That’s always been true—remember what happened to Dalmatians after 101 Dalmations?—but social media intensifies the impact, and increases the reach of the mania. Instagram stars like Loki, as well as the popularity of Game of Thrones, have created a huge surge in the number of people wanting to keep wolf-dogs as pets. Hybridizing wild and domestic species to create a more manageable animal isn’t necessarily a better option, though. Not only is the mating prcoess often dangerous for the domesticated animal, but the offspring frequently have genetic abnormalities and higher susceptibility to diseases. And while these animals are certainly less wild, they’re still far more unpredictable and difficult to take care of than their domestic counterparts, so many end up in shelters that are no more prepared to handle them than their owners were—and, sadly, many abandoned wolf-dogs end up being euthanized within a week. Does this mean that, in order to remain morally pure, one must unfollow all these accounts in a huff? Absolutely not. The trouble with exotic animal Instagram is that you have to assess it on a pet-by-pet basis. For every John Snow-idolizing wolf-dog owner who knows nothing of the breed, there’s someone like Anneka Svenska, who uses her Instagram and YouTube channel to educate people about the specialist care and knowledge wolf-dogs need, and the lifestyle sacrifices a responsible owner must to make to ensure their safety and happiness. Or the widely-beloved red fox Juniper, whose owners make it clear that she is as smelly and utterly impossible to house train as she is cute. “The animals have to come first, and the followers second,” says Vail. “But the personalities and charm people see in these animals on social media is impacting their perception of wildlife”. At worst, these pets are ill-advised accessories. But at best, they’re furry ambassadors educating people about, and generating empathy for, their wild brethren.